After World War 1 ended, the German Navy surrendered and many of its ships were interned at the Royal Navy's chief naval base at Scapa Flow in the Orkney Islands north of the Scottish mainland. 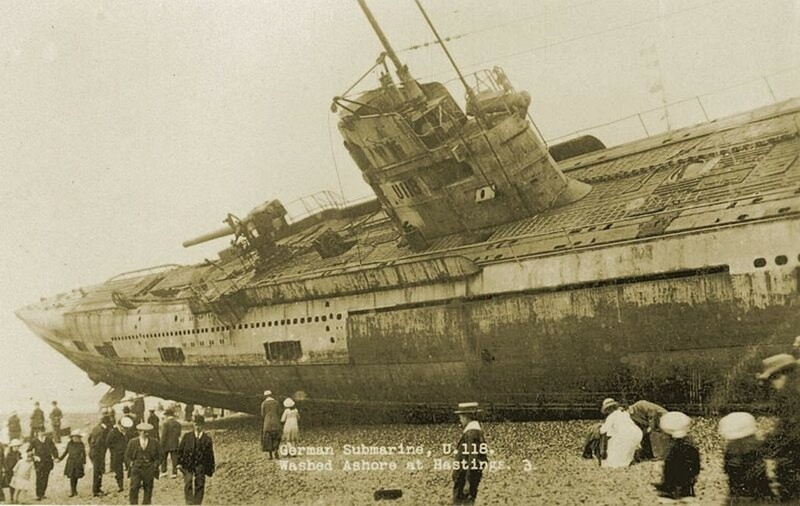 The German submarine U-118, however, was destined for France to be broken up for scrap. While she was being towed, a fierce gale snapped the cable and she ended up like a gigantic beached whale washed ashore on Hasting's Beach, in front of Hasting's finest hotels. SM U-118 was one of nine huge ocean-going mine laying submarines. Launched on February 23, 1918, she was 267 feet long, displaced 1,200 tons and was armed with a 150mm deck gun, 14 torpedoes and 42 mines. SM U-118 had a lackluster career, sinking only two ships, one just off Ireland's north coast and the other northwest of Spain. She was surrendered to the Allies on February 23, 1919, exactly one year after she was launched. 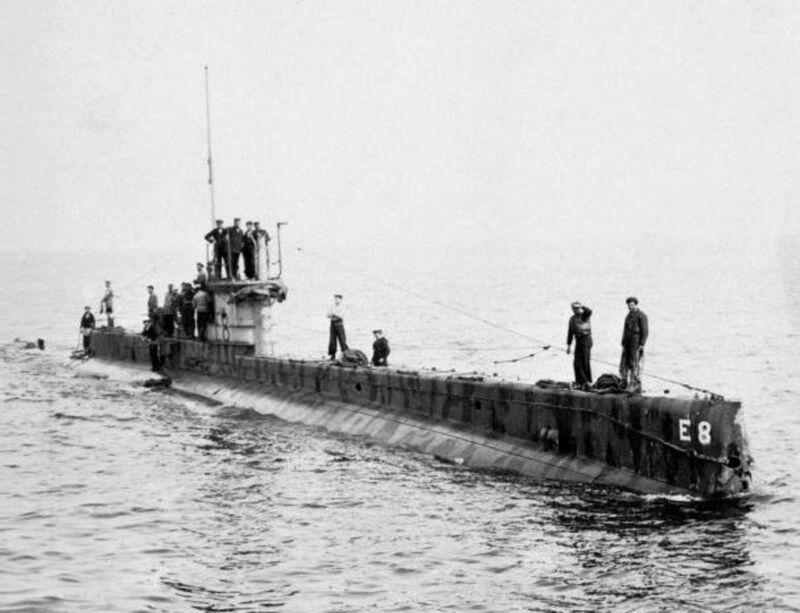 While being towed to France through the English Channel in rough seas, U-118 broke free. 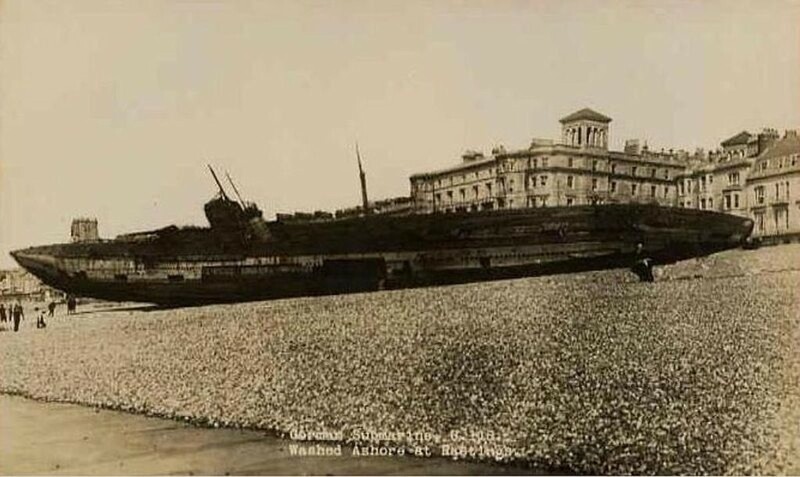 Despite attempts by a French destroyer to break her up, she ended up aground on the beach in the middle of the city of Hastings on the Sussex coast in southern England on April 15, just in time for the Easter Holiday. The stranding caused a sensation. Thousands of people flocked to see this monster that had washed ashore, it's true size evident from the aerial view taken shortly after the beaching. Three tractors tried to drag it back to the sea, but failed. 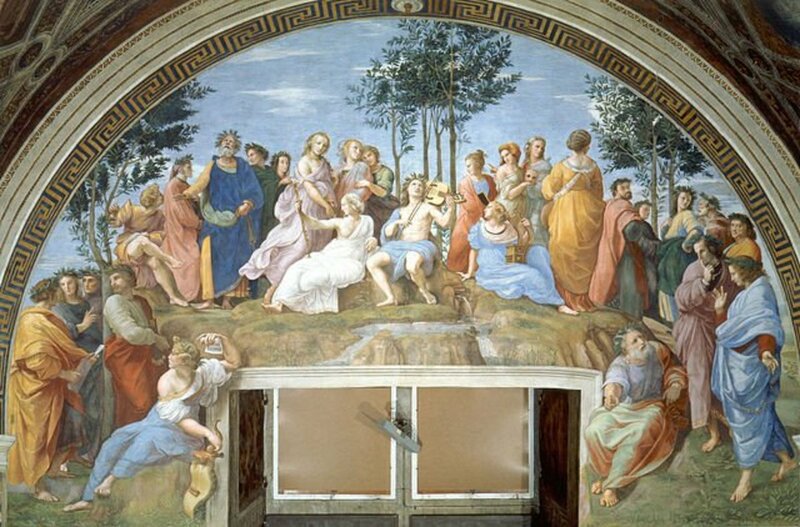 At that point, the city fathers decided to make the best of this instant tourist attraction. The Admiralty put the local coast guard in charge and allowed the town clerk to charge sixpence apiece to visitors wishing to climb onto the deck of U-118. After two weeks, nearly £300 had been raised for the Mayor´s Fund for the welcome home of troops planned for later that year. Special excursions inside the submarine were arranged for important visitors. These were led by two coast guardsmen, but the visits were stopped after two weeks when both these gentlemen became strangely ill. Instead of getting better, they got progressively worse, until, by February of 1920, both were dead. Their autopsies revealed abscesses in their lungs and brains, probably caused by chlorine gas leaking from the sub's damaged batteries. Eventually, the novelty of the grounded u-boat wore off and residents tired of the noise made by children throwing rocks against the hull at all hours of the night. 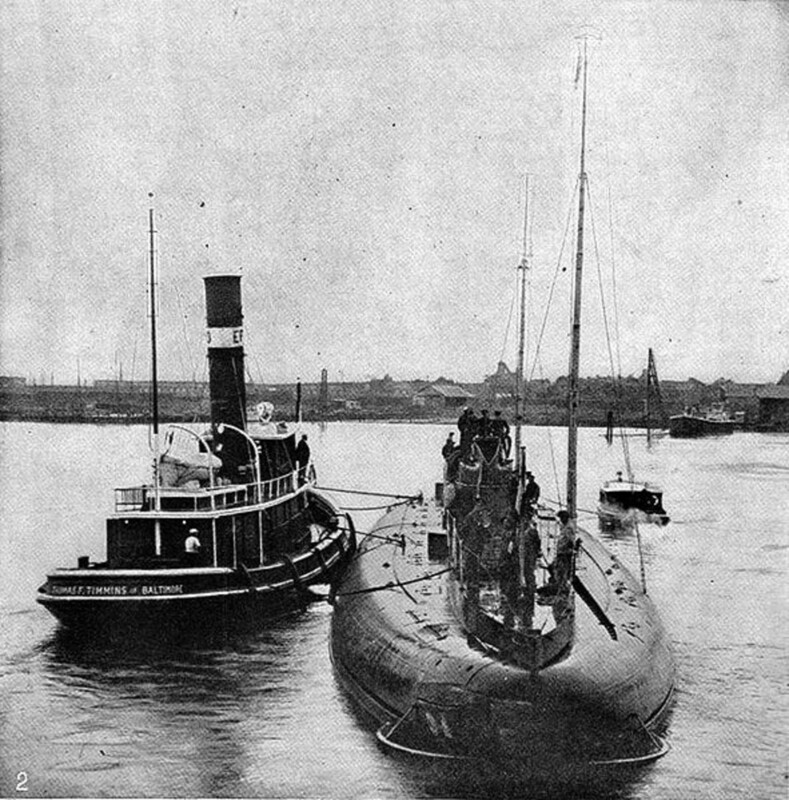 The decision was made to break up U-118 and sell it for scrap. 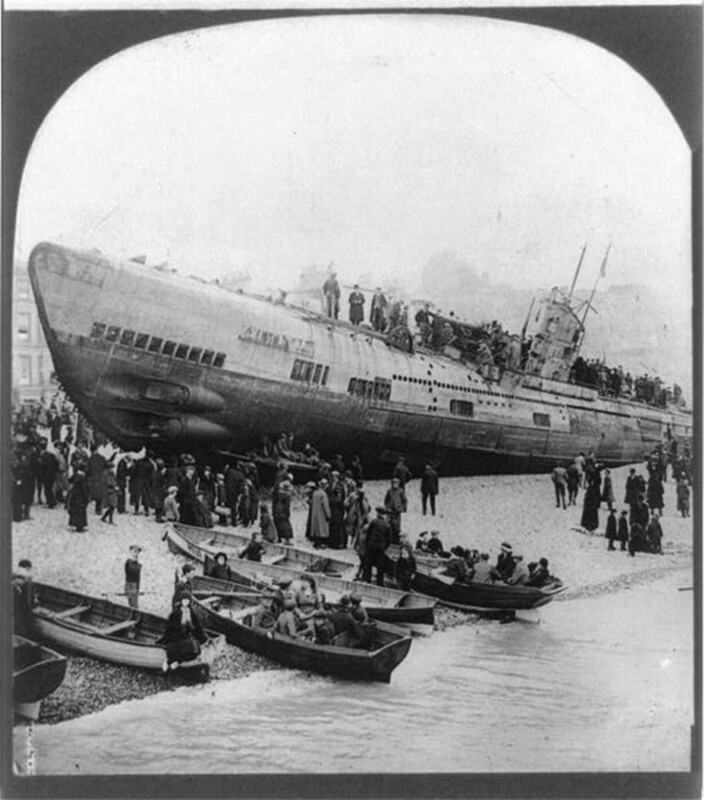 Before the official dismantling began, many souvenirs disappeared, but, by December 1919, U-118 was largely gone. The town was presented with the 150mm (6-in) deck gun, but they decided to get rid of it in 1921. It is believed that portions of the sub's keel still sit under the sands. 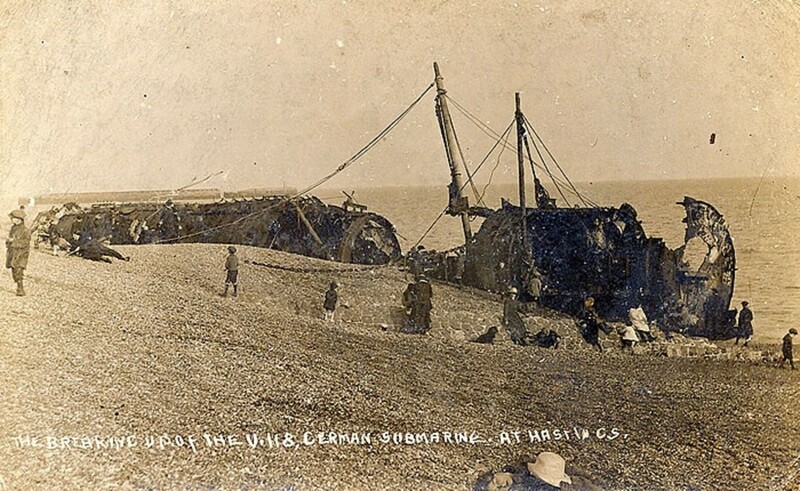 Oddly enough, U-118 wasn't the last submarine to wash up in Hastings. 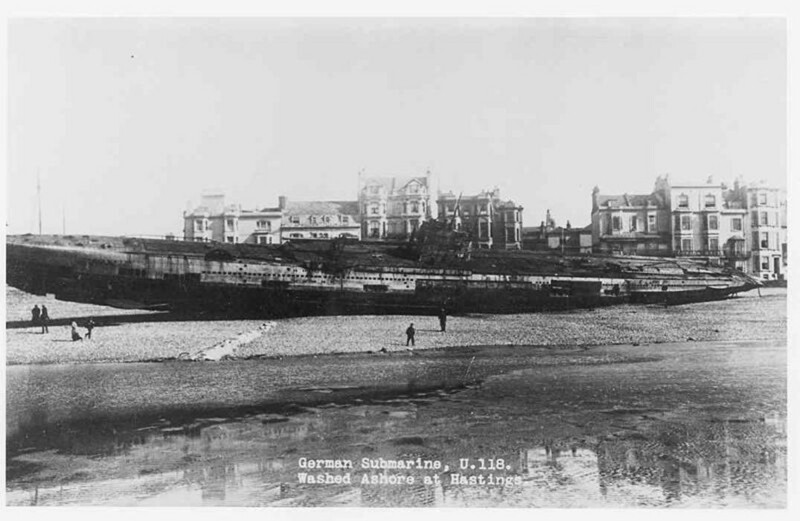 On January 9, 1921, another German submarine, UB 131, also broke free during a storm and ran aground on another beach at Bulverhythe, Hastings. Little is recorded about this second submarine, half the size of U-118, other than it was quickly broken up. What drew me to this story was the first image at the top of my hub-- I had to know the story behind it. 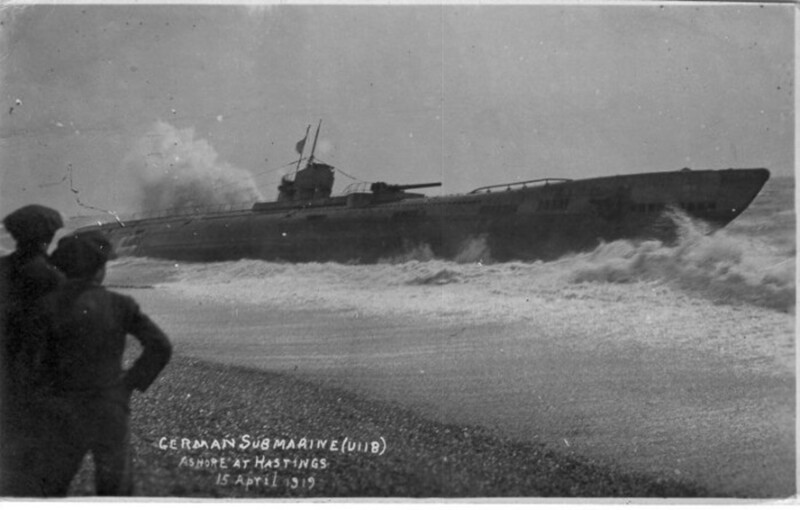 I didn't realize how big some of the subs were in WW1. Thanks for commenting, Asp52. 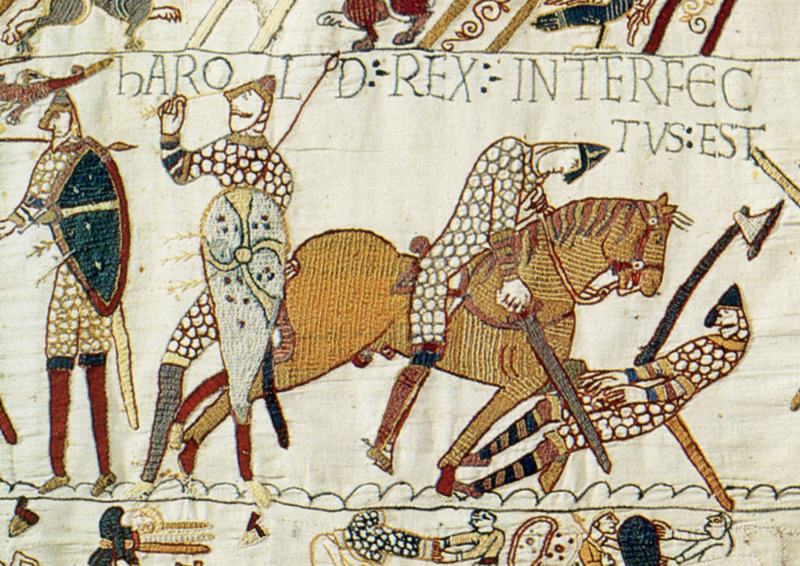 It seems nearly every city and town in Britain has some interesting bit of history attached to it. 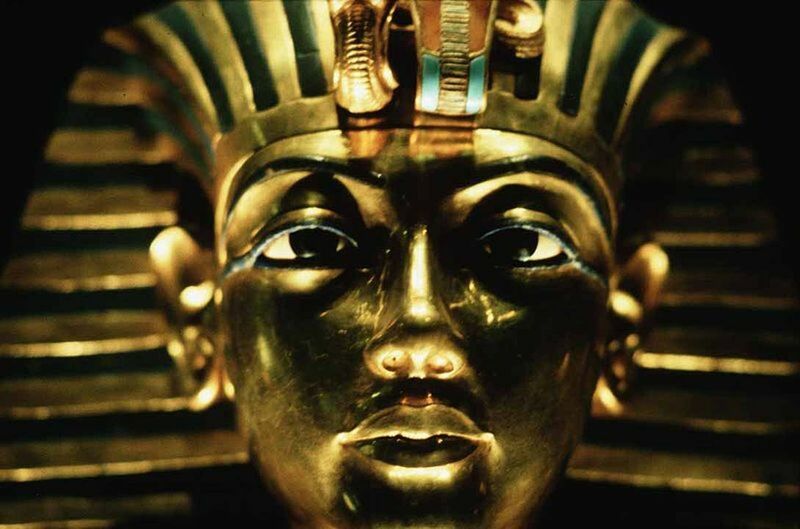 So much history! Thanks for such an interesting article on a subject which is often overlooked especially in recent years. I grew up in the North East of England and there is a wreck of a WW1 German Sub, which has been battered by the elements for nearly 90 years. It is just off the coast of Bridlington and is noted on a lot of the survey maps. I know very little of it's story though! Thanks, Graham. When I saw the picture of that beached sub, I knew I had to write about it if I could find enough information. Hi UH. Great hub. Well researched as usual and so very interesting. I had not heard of either of these events. Top class. Hi peter. That's what I thought-- maybe the tides or currents make it a popular destination for wrecks! Thanks Pavlo. And if I'm not mistaken, it would be the only WW1 submarine in existence. It is a pity it desappeared.. That submarine would be a great attraction nowadays and would attract thousands of visitors. Great hub! 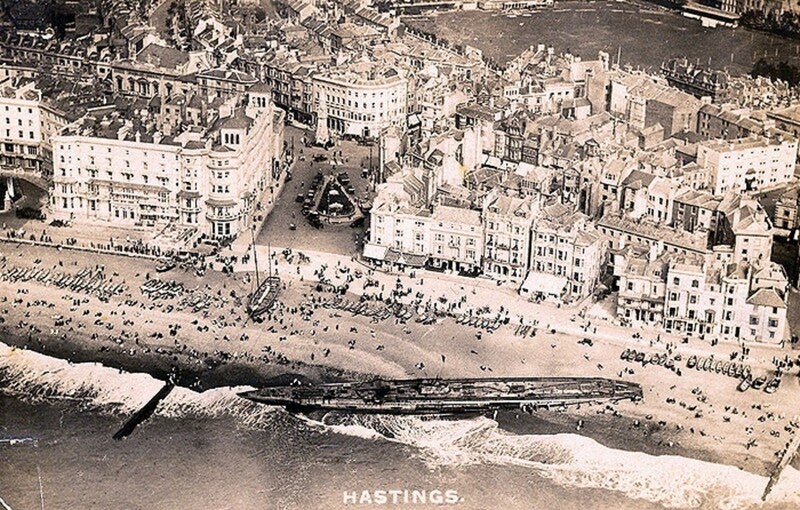 Steve, I've read some comments regarding this from Hastingers... Hastingites... citizens of Hastings who bemoan the tightness and short-sightedness of former city fathers. On the other hand, the Germans might have bombed the hell out of it during WW2-- just 'cause. Hey, thanks for commenting. A fascinating article David. Vote Up and Interesting. Hi Peter. Ahh, I wish I lived on the coast. Some of my fondest memories are the times I went to Hayle and St Ives in Cornwall. Now, the nearest coast is almost 1,000 miles away (not counting the Great Lakes). Thanks for your kind comment. Excellent well written and researched article. Ship wrecks of all types have fascinated me ever since I was a small boy and played on the remains of the "Duchess of Devonshire" wrecked on the Devon coast. Hi Joan. As I mentioned, the instant I saw that image I knew I had a hub. 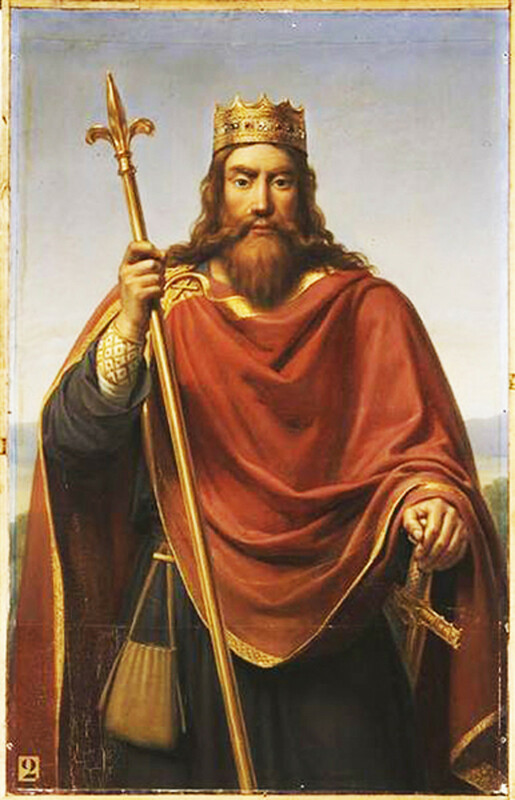 It was a huge bonus that there were so many other images in the public domain. Thanks for your great comment. Hi UH, I'm on my way to catching up with my reading, and started at the end! This was fascinating, you do manage to find the most exatraordinary topics! That aerial photo is a materpiece! Voted up, awesome and interesting. Shared. Have a good day! Thanks, aethelthryth. While U-118 only managed to sink two ships (totaling about 10,000 tons), UB 131 (the second sub to wash up at Hastings) didn't sink anything. Glad you enjoy the bits! The part about the lackluster war record sounds like another candidate story for a movie. A comedy, along the lines of "Operation Petticoat". I enjoy these odd and interesting bits of war history you come up with. @sjwalsh and @gmarquardt, thanks both for reading and commenting. I was looking for inspiration, saw that aerial image and a hub was born! Fascinating! I didn't know any of this!!! Hi sjwalsh. Thanks for commenting-- that reminds me, I have some catching up to do. This hub breaks a fast of over a week without a hub. Feels good to be back. Love reading you Hubs where we have so many interests in common! Voted up of course! Nice to meet you, lindalou1963. Thanks for reading and commenting. Thanks much for commenting, nightnight. I envy you being able to go to Hastings-- that's one spot I never got to. Glad you enjoyed it. I particularly like the great public domain images available-- especially the aerial view. Fascinating read. Thanks for sharing that, I've been to hastings recently, and didn't know that!